Home allergens are truly a feisty bunch. They affect everything, from flooring to furniture, and pretty much every house harbors at least a few of them. What's worse, the presence of allergens in high numbers can trigger a wide variety of symptoms ranging from sneezing fits to runny noses. Allergens tend to thrive in places that are susceptible to the accumulation of dust and other particles. Getting rid of unnecessary clutter is the first step towards an allergen-free home. This includes things like old rags, magazines and other porous items. Children's rooms, especially, can be a veritable treasure trove of plush toys and other tidbits that can become a haven for dust particles if left unchecked. Related source: Declutter home in 20 steps. 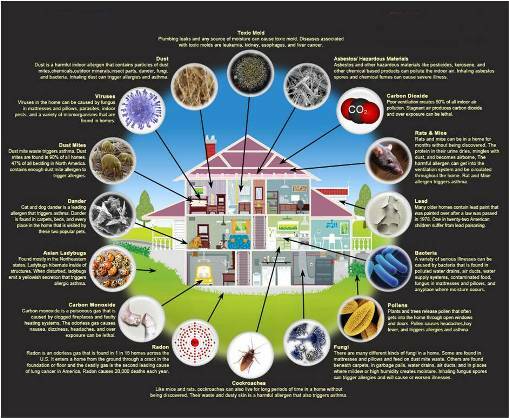 Air is by far the most significant medium through which allergens enter your home. Make sure you shut out breezes by closing doors and windows whenever possible. You should also consider installing filters in your air conditioning and furnace systems. These will keep the vast majority of airborne particles from infiltrating your indoor air. Another important factor to consider lies in keeping allergens off your carpets and rugs. Their textures are perfect for harboring dust mites and the like, which is why regular vacuuming can only do so much. If you really want to be on the safe side, consider calling an expert cleaning professional that uses a real steam cleaner to get the job done. Aside from being rather unpleasant on their own, the presence of bugs, especially roaches and bed bugs, can often lead to various health issues down the line. Make sure your house is sealed from such invaders by keeping everything dry and clean. You can also bring in an exterminator if the situation calls for it. No matter how much you may love your dog or cat, the fur that pets have is always ripe for carrying potential allergens into your household. While the ideal solution would involve keeping your pets in a protected outdoor area, this simply isn't feasible in many situations. So at the very least take steps to ensure that your little furry friends aren't spending their all their downtime cuddled in your bed. As you can see, learning how to clean your house efficiently and smartly can make all the difference in the world. Even picking the right cleaning supplies is important, as you'll likely notice that many of them contain harsh chemicals that can exacerbate your symptoms no matter how well they clean. If that happens, simply swap them with their natural, less-chemical versions and see if you notice any improvements. After all is said and done, it's worth mentioning that you can't ever completely eliminate all allergens. What you can do, however, is reduce their negative influence, thereby enhancing your own quality of life. Parents, do you want to improve your life to be more productive? Learn more from this comprehensive list of powerful productivity for parents. Yes, I agree with you....this blog is showing basic information. This blog is showing detailed information about the topic and I am agree with the information. Great keep it up!